Each half term throughout Key Stage 3, students complete a new ICT project covering the three main strands mentioned above. Within these units we have placed an emphasis on developing transferrable ICT knowledge, understanding and skills. Over this half term, the key learning objectives for the learners have been to develop their understanding and awareness of internet safety. E-safety is an integral part of our learner’s education in today’s digital world and this has been embedded in their learning during this half-term project work. As part of our learner’s curriculum and the development of computer skills, we strongly believe that the use of the web and technology is hugely worthwhile and an essential tool as they grow up in the modern digital world as it becomes a platform they use to learn, play, socialise and express themselves. 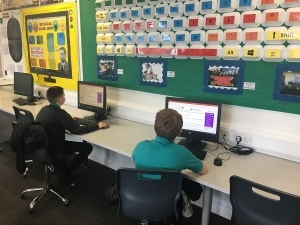 As there are always concerns about children having access to undesirable materials, we have designed a curriculum which aims to improve their own understanding of e-safety issues so they can learn to use the internet and all digital media in a safe and secure way.